A large number of spells and rituals in the Munich Manual deal with the discovery of information, lost or stolen items, and theives, since theft was (and is) a large concern in most people’s lives. While most of these spells fall under the class of divination, another large number relate to glamors or mirages to appear or make use of, including rituals to become invisible. I’ve translated a few of these sections below on finding and hiding. Some of the rituals require the killing of animals, the use of a young child as a medium, or other potentially dangerous acts, so caveat magus. All translations are based on the text given in Richard Kieckhefer’s “Forbidden Rites: A Necromancer’s Manual of the Fifteenth Century”. 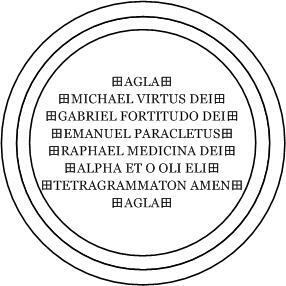 For finding that which you wish for in sleep, write these names on virgin parchment with their names of God in this way so that the lower [realms?] will be open. Afterward, put it under your right ear when you go to sleep, and you will see that which you wish for in the past, present, and future. …whatever about such a thing or place that your desired matter is to have come. And you shall say this three times, and you will see whatever you wish, by the power of God. This is the circle which you should write when you go to sleep. O rabbi, rabbi, my king and my God and ruling master, who are the preserver of the entire world, hear my prayer, me who is a wretched and unworthy creature, and from your redemption now and always, let my unworthy cry come to You. I call and appeal to you that you deign to send to me a spirit of truth in sleep this night, and that it reveal to me hidden treasure. Oriens, Oriens, Oriens, I beg, I ask, and I seek, o kindest Oriens, that you complete my vow and that you wish to respect on my requests. And then a spirit will come to you that will not bother you, but make you dream of treasure and lead you properly to the place. In the morning, when you rise, make three almsgivings in honor of the great knowing King, and go in company or alone to where treasure is in your home[? ], and take it. After you have the treasure, sing three Masses: the first in honor of the Holy Trinity, the second for the sins of the dead, and the third for the preservation of your life, &c.
O you most holy names, I ask that you send to me two or three angels into this crystal, who shall tell me the truth of these things that I will inquire about. And I ask you angels that you tell me the truth that I inquire about from yourselves. I conjure you in the name Dedeon, and the gods Egarias and Semisonay and, on behalf of my master, that you come into this crystal, and reveal yourselves that I be able to see. I conjure you in the name Bessabes and Hint and Serem and Salaboni and Lethem, that you do not withdraw from this crystal without the leave of my master, who himself is present here. An experiment of a cystal for the discovery of theives. deign to consecrate and bless it, by Your honor and glory, living God who rules, world without end, amen. Agla, Otmonta, Panoneogens, Origmaria, do not hinder Asia, Africa, Europe, or any parts within them, but that you come to us. Let it be, let it be, let it be without delay. that you do not withdraw from this stone until we are sure of all doubtable things that we wish to know, by the power and submission of God almighty. Amen. It is also to be noted that no one should use this experiment for cheap or common things but for noble causes, and also because it is said elsewhere that “you shall not take the name of your God in vain, nor invoke Him uselessly, &c”. Take for yourself a piece of iron that was found unexpectedly, and make yourself a key to be made in this manner, made on the day of Venus. O spirits Neyilon and Achalas, accept this sacrifice, that nothing may prevail against me or this key when this key is put into a lock. Leave it there for three days. On the third night, before daybreak, take it from there. When you cross through the city, keep the key in your left hand from the west to the east, and it will open all locks. And this is called the Key of Pluto. Sapreson lampsones sampsanay, let a man be invisible. Then fill it up again with wax, and bury it in your garden into which nobody enters, and water it with human blood and water mixed together, which is to continue for 15 days until a white plant grows, the seeds of which are always for the repeating of these words. Know, however, that whenever this plant gives you a seed, take out only one good grain of them, and repeat the above names. Then you should have a mirror in your presence and, looking back on the grain after looking into the mirror, put such grains in your mouth under your tongue, and always consider well that grain which is in your mouth. And if with any such grain put into your mouth you are unable to see yourself in a mirror, you will know it to be good and useful for you, &c.
O you who are owed sacrifice, aid me to fulfill my vow. Return home before the rise of the sun, and you will find there another sheet and a coin wrapped inside, and you shall tie it into your hair when you wish to be invisible. Take care, however, that you leave behind the dove and parchment, and that you not take them in any way.